Ah, midsummer in Boston. Swan boats cruise languidly in the Public Garden lagoon while tourists feed the ducks popcorn and peanuts. Squirrels (tree rats) beg for food and brazenly assault strollers in the Boston Common who are on their way to work or to shop. The Red Sox are in first place and are well on their way to winning 100 games this year. Take that wicked Yankees! The Italian ice limonata at Polcari’s is as delicious as when I was a child, even if it is a bit more expensive. Sitting at the bar in the Union Oyster House with a cold mug of beer and a plate of Wellfleets is as pleasurable as when Daniel Webster dined there before the Civil War. Life doesn’t get much better than this, my friends, except if you live in the North End. Walking down Commercial Street or trying to navigate the Charlestown Bridge, one can’t help but notice the number of tourist trolleys and LST (landing ship tank) crafts, renamed Duck Boats, surrounding our neighborhood. D-Day is a year round event here in the North End. 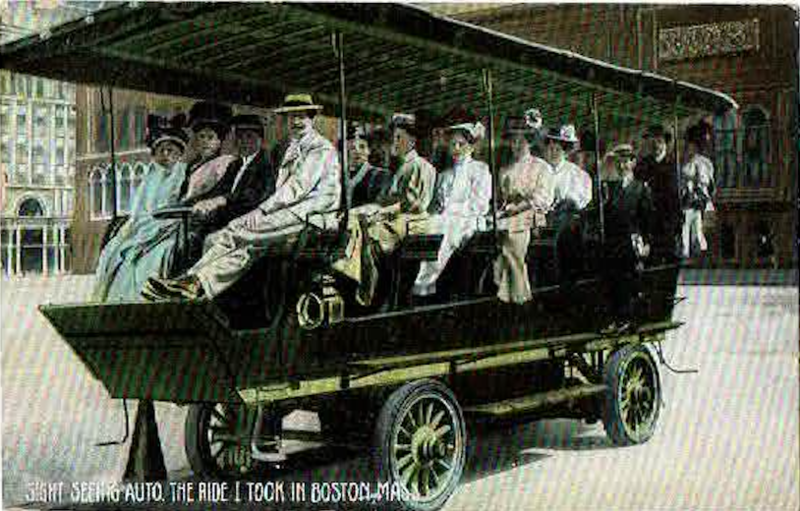 The postcard I’m sharing today dates from 1910 and depicts an early motorized tourist trolley which eerily resembles a miniature version of our contemporary Duck Boats, although the scale is much different. The tourists are very different as well, much better dressed for one thing, and I doubt if they have those annoying duck quackers. My uncle, Willie, was a master sergeant in the Army during World War II and he landed on a lot of Pacific island beaches in LSTs. I wonder what he would think of all the tourists riding around in these landing craft that helped us win the war? Where do you think this picture was taken? My guess is Copley Square, but I am open to other suggestions. Next articleReader Poll: Should Electric Scooters Be Allowed in Boston / the North End? Nice article on the Duck Boats. To this day I haven’t been on one. Yes, the people in the picture would be considered over dressed for our era. The best part about the boats are our sport heroes celebrating through the streets!